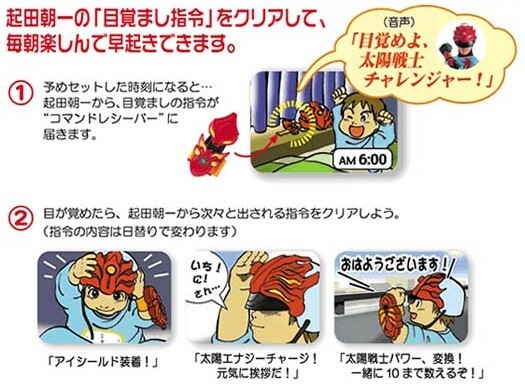 Japanese toymaker People [JP] recently released a bizarre invention that is supposedly able to turn all sleepyheads into early risers. The so-called Okiro! Asa Ichiban Taiyou Senshi – Charenjaa Kitto (Wake up! First Sun Warrior of the Morning – challenger kit) is Nippon only and made to support the “early to bed early to rise” program of the Japanese Ministry of Education. 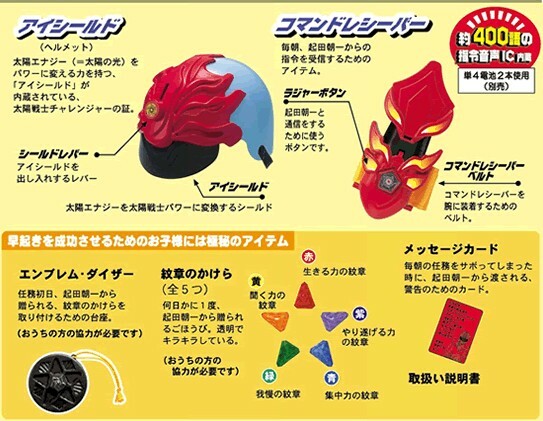 The kit consists of an eye shield (helmet), a commando receiver, a 5-piece talisman and a message card. Owners are supposed to learn how to get up early and begin the day with a healthy breakfast through a special routine that is recommended to be repeated at least for 27 days. An alarm clock, which is built into the commando receiver, wakes you up at 6 o’ clock in the morning. Players are first supposed to push the “roger”-button on the commando receiver and then wear the helmet. To make sure you begin the day with energy, you have to count to 10 in 5 different languages, repeating after the commander whose voice is coming out of the eye shield. Languages include English, Japanese, German, Swahili and Malagasy (official language of Madagascar). Only then is the player allowed to take off the equipment and start the day. The morning warrior set is available for $38, for example at Amazon Japan [JP]. People says they are not only targeting children with their toy, but also Japanese NEETs (people not engaged in employment, education or training).